I am going to share with you one of my guilty pleasures. I love to go to real estate open houses. I love to discover new neighborhoods and picture in my mind how I would decorate or how I would feel living there. I will do landscape design in my head, pick up decorating tips, storage ideas and sometimes just see how other people creatively use their living spaces. And I have to admit that a number of years back, the thought of living above a storefront conjured visions of poor shopkeepers and the less fortunate that lived there as a stepping stone or as a last resort. Well, when I did the Taste & Tour of Old Town, my opinion changed drastically and my eyes opened to endless possibilities of city living. 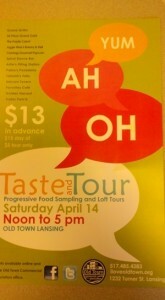 Buy a ticket, sample some delicious foods from local eateries and get a glimpse into loft and condo living in Old Town. Think hardwood floors, high ceilings, open concept spaces and the excitement of shops, dining and festivals right at your feet. And believe me, Old Town has a quaintness, charm and neighborhood feeling that you dont get just anywhere. Theres a hip-ness, a cool factor and a trendy cache that comes with having an address there. I missgoing to workin Old Town. I count myself as fortunate that I worked on Turner St. for 10 years. I was there 5 days a week and returned on the weekends for the shopping, festivals and events. It became a second home and I got to know the neighborhood pretty well. I can still head over and run into friendly faces and familiar spaces.My eldestsons senior pictures were taken in Old Town. So, when I encourage you to hit up this Saturdays Taste & Tour of Old Town, I hope you will go. Youll find some hidden treasures that you couldnt have imagined and I guarantee that you will find yourself immersed in thought about living in the center of culture and creativity. Saturday, April 14, noon-5 p.m.